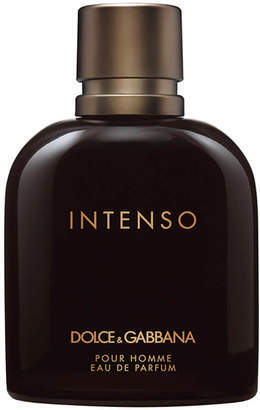 Discover Dolce & Gabbana Pour Homme Intenso Eau de Parfum; a woody aromatic fragrance defined by a new discovery in the olfactory world: the Moepel accord. The Moepel (Milkwood) is a South African tree with a unique odour obtained using Headspace technology, which captures the floral, balsamic and rich honey accents of the flowers and leaves. Fresh notes of Basil and Geranium are enhanced by aromatic Lavender and striking Tobacco, before finishing on a rich, warm base. Housed in a dark brown lacquered glass flacon with a curved silhouette and a cylindrical copper-toned cap. Top Notes: Basil, Marigold, Geranium. Heart Notes: Lavender, Tobacco, Bran. Base Notes: Labdanum, Sandalwood, Cypress.